Over the span of few days 12 authors born on islands all around the globe — in the Caribbean, the Mediterranean, the Atlantic Ocean, the Baltic, Indonesia, Japan etc. 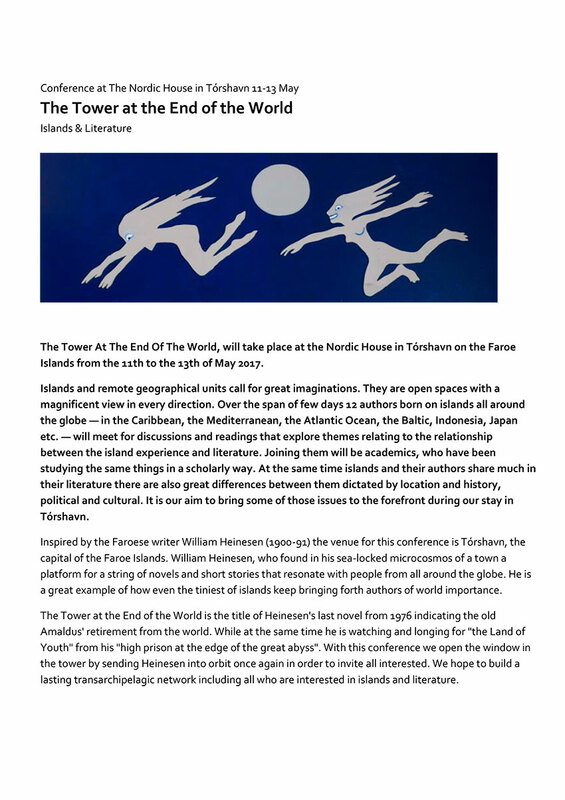 — will meet for discussions and readings that explore themes relating to the relationship between the island experience and literature. Joining them will be academics, also from all over, who have been studying the same things in a scholarly way. At the same time islands and their authors share much in their literature there are also great differences between them dictated by location and history, political and cultural. It is our aim to bring some of those issues to the forefront during our stay in Tórshavn, the capital town of the tiny Faroe Islands archipelago. The reason for choosing the Faroe Islands as the meeting place is that it is the birth place of one of the 20th century giants of Nordic literature, William Heinesen, who found in his sea-locked microcosmos of a town a platform for a string of novels and short stories that resonate with people from all around the globe. He is a great example of how even the tiniest of islands keep bringing forth authors of world importance. 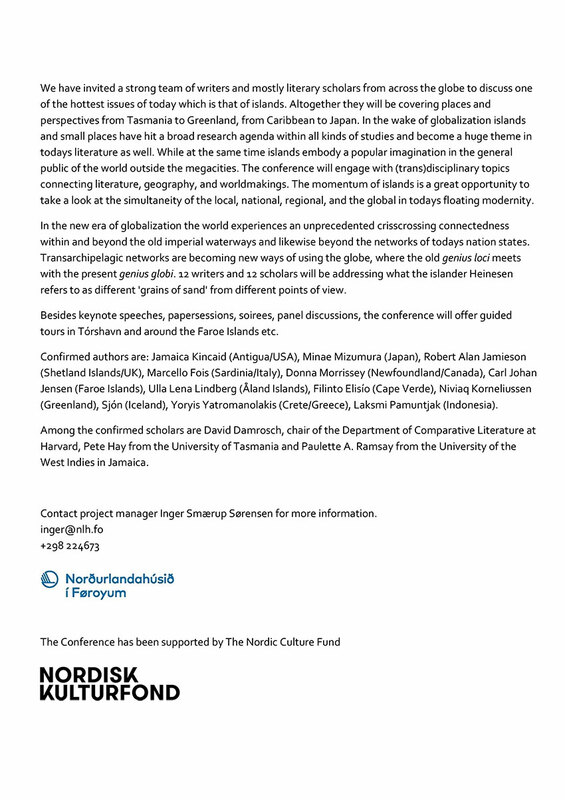 Confirmed authors are: Jamaica Kincaid (Antigua/US), Minae Mizumura (Japan), Robert Alan Jamieson (Shetland Islands), Marcello Fois (Sardinia/Italy), Donna Morrissey (New Foundland/Canada), Carl Johan Jensen (Faroe Islands), Ulla Lena Lindberg (Åland Islands), Filinto Elisío (Cap Verde), Niviaq Korneliussen (Greenland), Sjón (Iceland), Laksmi Pamuntjak (Indonesia). Among the confirmed scholars are David Damrosch, chair of the Department of Comparative Literature at Harvard, Peter Hay from the University of Tasmania and Paulette A. Ramsay from the University of the West Indies in Jamaica.